For seasonal allergy sufferers, it is usually easy to know when Spring is in the air, because of the pollen it brings with it. However, year-round allergies could point to problems with the air in your home. But how can you tell if your morning sneeze attacks are one of Spring’s cruel tricks or a consequence of poor air quality? 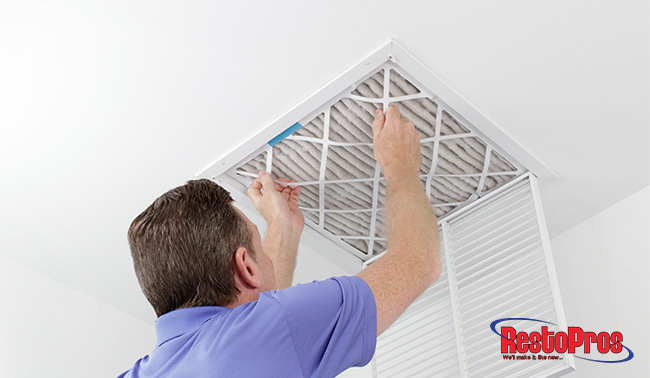 Well, the team at RestoPros is here to tell you how to test your home air quality so you can find some answers! There are two types of tests to measure radon: short-term tests, which measure radon levels in your home over a period of 2-7 days, and long-term tests, which measure radon levels for a period of 90 days or more. Both tests can include kits using passive or active testing devices. A charcoal canister is a short-term test (from 2-7 days.) Place your canister in a dry area of your home for the best results. Each canister contains activated charcoal. Over the course of a few days, radon will be absorbed onto the charcoal and then measured at a lab with a sodium iodide detector. Contrary to a charcoal canister, this is a long-term test. An alpha track test measures your exposure to radon during different seasons. Considering the affects changing weather and ventilation habits have on radon levels, this test provides a more reliable estimate of actual risk. An alpha track testing kit is also simple to use. An Electret Ion Chamber device is another reliable long-term test option. After placing it in your testing area, an electrostatically charged Teflon disk inside the test chamber is struck by the ions produced from the decay of radon. This strike reduces the surface voltage, which is then measured in the lab to calculate the radon concentration. These portable devices are designed to measure radon levels in your home for 2 to 7 days, making it a short-term test. Testing can be done with this device during any season, as long as it’s done within closed building conditions. This testing device gives hour by hour measurements of the radon levels in your home. In addition to the levels, this device also measures movement and power interruptions. Swab the surface you want to test. Wait 30 seconds; if the tip of the swab turns pick or red, the test is positive for lead. If the tip of the swab does not change in color, the tested surface is lead-free. Select an area of your home with low traffic, such as the wall behind a door or inside a closet to test for lead. Wipe down the testing area and your testing tools with the wipes provided in the kit. Once the area is wiped down, attach the paint chip catch card that is included in your kit to the wall. Then, use your scoring tool to start the cut right above the catch card. Next, remove the paint chip from the wall with the razor blade from your kit. While completing this step, make sure to remove any layers below the surface paint, as the house may have been repainted with non-lead paint. Now, cut the paint chip into about four small pieces and drop them into solution number 1 from your kit. Then, shake solution 1 for 10 seconds; then, add 5 drops of solution number 2, and shake again for 10 seconds. After shaking the two solutions and paint chips together, the solution will change color. Measure the resulting color against a color-coded viewer that is on the bottle. If the solution is darker than the test color, your paint probably has some lead in it. For further verification, there is another strip included in the kit that you can drop into the solution. A PID blasts air samples with high-energy photons in the UV wavelength variety. During interaction with the UV light, VOCs take on this energy and release negatively charged electrons. This leaves them with a positive charge that is measured with the circuitry of the detector. Similar to a PID, these sensors rely on gas molecules’ inclination to absorb light. After infrared light bombards the air sample, different gases absorb specific wavelengths of the light. The infrared sensor checks which wavelengths are missing after the light passes through the sample cavity. As a result, the NDIR device can tell which gases are present. Being sensitive to VOCs, a GSS will exhibit changes in its electrical conductivity in response to polluted air samples. The measurements of the differences in readings can determine the concentration of VOCs and ozone threats. Operating similarly to a GSS, a MOS is sensitive to dangerous gases, such as ethylene glycol and carbon tetra-chloride. However, unlike a GSS, some MOS devices include heating elements that can increase the sensitivity to dangerous gases for a more measurable response. The holograms that make up these sensors contain specially selected materials that modify their refractive index when they interact with VOC molecules. Therefore, the VOC molecules are measured by the changes in the color of the reflection. Remove the petri dish from the plastic and place it on a level surface with the lid side up. Then, remove the lid and pour the mold growth medium (potato dextrose) into the dish. Next, put the lid back on the dish and gently swirl the potato dextrose until the bottom is completely covered. Once this is achieved, allow it to gel for one hour on a level surface. After the potato dextrose has gelled, place the petri dish on a level surface in the area you want to test. Remove the lid of the dish and leave it open to the environment for 1 hour. Once 1 hour has passed, replace the lid and let the sample incubate for 48 hours. When the 48-hour incubation period is over, examine the sample. If there is no presence of mold, re-check the sample at the 72-hour mark and the 96-hour mark to be sure you have not overlooked slow-growing mold. If mold growth is present, you can send the sample to the lab associated with your kit for further testing. You can purchase many different types of kits to test samples from household surfaces for mold. These kit tests can involve a swabbing or tape lifting Once you have followed the instructions from your testing kit to collect surface samples, you will send the sample in the provided return mailer to a lab for testing. Although you now know how to test your home air quality on your own, it is always a smart move to let a professional air quality expert conduct a thorough inspection. With the vast array of factors that could be affecting your air quality, there is no better team to trust than the experts at RestoPros. Whether you need help with a mold problem or just want to improve your home’s air quality, call us today at 855-587-3786 or fill out a service request form on our website for quick and reliable service!